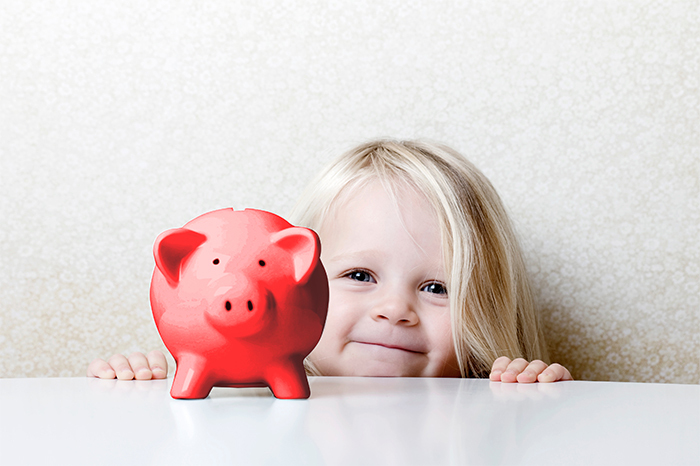 KidStart Magazine > Saving Tips > Save for your child > Piggybank Raid! As someone whose own finances this month make Greece’s financial problems look like Aristotle Onassis’s, I was fascinated to read that 57% of parents raid their children’s piggy banks when running short of cash. The KidStart office popped the survey from the Clydesdale and Yorkshire Banks under my nose this morning before I had even mentioned that the only money in my purse (£2.57) was all that was left from the tenner I had borrowed from my eldest daughter, Ella, two hours earlier. Technically it’s not a loan, because she still owes me £130 for her festival ticket, but we have been swapping the same £40 to and fro between us for the last two days, and I think, somehow, I’m ten pounds down on the deal. It doesn’t help that she got an A in maths and I got a C.
But back to the Clydesdale and Yorkshire survey of parents and their five to 12 year old children which pointed out that parents think nothing of diving into their children’s savings when times are lean. Of the 57% who borrow from their primary school children’s money 18% raided their children’s savings accounts and eventually paid them back, but 3% never did! Now hand on heart I can say that so far I have never had to dip into their savings – and nor do I borrow from primary school children – they’re too poor – and would make far too much fuss – if you’re going to borrow, be like Greece and borrow big – what could possibly go wrong? 80% of homes bought since 2006 are now worth less than their owners paid for them according to property website Zoopla.co.uk. The technical term is that your house is “underwater”, so don’t forget to drop that into the conversation in the playground…. Cheer yourself up with a bouquet from Bunches and nab 7% for your KidStart kiddybank – and no we won’t let your raid it – not even top up your Oyster card!